Just over a decade ago, Weezer proposed the question: Can the arch be pop? In the wake of Nirvana's tortured engagement with mass acceptance, Weezer and its self-conscious lyrics and impossibly outsize hooks became a sort of epic, snide rebuke to indie-rock navel-gazing. Outsiders, the band contended, were just as capable of doping the masses as the popular kids were. A funny thing happened, though, during the three years since Weezer's last release, the poorly received Maladroit . The genre that the band inadvertently helped generate-emo, which prioritized male solipsism without the benefit of testosterone-gained a significant pop following. 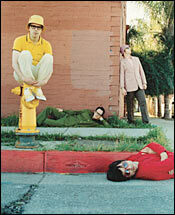 (The second Weezer disc, 1996's Pinkerton , is often cited as a sort of emo Rosetta stone.) All of a sudden, mainstream rock bands weren't arguing at top volume anymore. Now everyone wants to share. And Weezer is well equipped to compete in this newly upended pop hierarchy, having drawn much of its renown from front man Rivers Cuomo's ongoing love affair with his own idiosyncracies. Cuomo is lately known for weeks-long silent-meditation retreats, returning to Harvard here and there to work on his undergraduate degree, and posting blog entries to MySpace.com . For the production of its new disc, Make Believe , Weezer turned to Rick Rubin, a devoted Buddhist and devoted pop minimalist. Rubin has stripped down the Weezer experience-particularly necessary after the dense rush of sound that was Maladroit . And Cuomo, too, is purging, but maybe he needed his defense mechanisms-much of the album's second half, in particular, feels bare and platitudinous. "We Are All on Drugs" is numbingly preachy. The paired songs "Pardon Me" and "My Best Friend"-which seem to be, respectively, a plea for Cuomo's bandmates to understand his post-enlightenment path, and a subsequent love letter to them-sound like dull recovery mantras from someone not yet ready to face the world and its complex obstacles. Many of these songs are thin schematics for "perfect" pop songs. They're impressive in their commitment to formula-deploying catchy, whiny hooks, taut structure, loud-soft interplay, and well-timed guitar peals. Yet for all their nakedness, they offer little in the way of revelation. Cuomo manages the odd piercing line-"One more tear falling down your face / Doesn't mean that much to the world"-but never approaches the open catharsis that the band's earlier records achieved. Still, there are some encouraging signs that the wry Weezer of years past remains intact. The album's first four tracks are visceral and eccentric. The yelping, desperate "This Is Such a Pity" sounds like a New Order cover-it may be the first-ever danceable Weezer song. And the artfully self-loathing "Beverly Hills" suggests Cuomo has found fertile common ground in the peacock-camp of classic Queen and the mopey arrogance of Odelay -era Beck. And then there's "Hold Me," which should be the perfect last-dance song for this year's senior prom. Opening with a glacial, unadorned guitar line, the song oozes pathos-"I am terrified of all things / Frightened of the dark / I am." By its end, solitary man and arena-rock band coalesce, with a pomp that would befit Journey in its prime. The loser is wailing to every couple in the room, pleading for a hug. If "Hold Me" had been recorded by any of the emo outfits who borrowed song stylings from the early Weezer-Simple Plan, say, or Dashboard Confessional-"Hold Me" might actually be the new millennial soundtrack to the awkward longings of prom night. But Weezer now seems destined to sit on the sidelines at the gym. The pretty boys have stolen all the girls back, and are crying on their shoulders.